Workers of China Railway N03 at one of the road sections under construction. 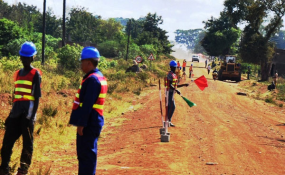 Government says it will investigate claims of torture and other forms of mistreatment by a group of workers employed by China Railway N03; a Chinese company which was contracted to upgrade the 195-kilometer Moroto-Soroti road in Karamoja Sub-region. This comes after a group of Ugandans working for the company appealed for protection from relevant authorities against what they termed as inhumane treatment by managers of the Chinese company. The workers say, on a daily basis, they are insulted and assaulted by some of their Chinese supervisors for no reason. Mr Patrick Lokol, a driver, said workers who fall sick or get injured while on duty are forced to work in order to avoid being summarily dismissed. According to Mr Lokol, the Chinese managers took the original copies of driving permits from 12 drivers and whenever they demand them, their supervisors claim that they misplaced them. Mr Pius Bigirimana, the Permanent Secretary, Ministry of Gender, Labour and Social Development said the labour policy is clear and any company employing Ugandans must observe several conditions including safety and a good working environment for their employees. "As a ministry, we will investigate those accusations and appropriate action will be taken against those mistreating Ugandans," he said. However, Mr Li Wang, the company's chief engineer told this reporter that they took the drivers' original driving permits to verify them. "We took the original driving permits of drivers and we requested them to allow us keep the permits but I'm not sure how they got lost. However, I am following it up," he said. Mr Jovias Wamuno, said any mistake by a worker attracts a slap or a kick from one of the Chinese supervisors. "They can instruct you to do something but as you are doing it, others come and kick you. The man [supervisor] can kick you over nothing instead of correcting you," he said. Ms Joyce Nakut who quit the job over similar mistreatment claimed that workers who report the ill-treatment to the top company administrators, do not get any help. Mr Joel Okurut, another worker wondered why most of their supervisors are rude. "I can't explain the kind of hearts God gave these Chinese. We call upon the relevant authorities to come to our rescue before we take a serious industrial action," he said. Mr Mark Sali, the communications director of Uganda National Roads Authority said they would investigate the matter and take action. "I'm glad that the matter has been brought to our attention. As UNRA, we shall investigate and get to the bottom of the matter and action will be taken," he said. However, Mr Joseph Opio Osoto, the Moroto Resident District Commissioner, said his office has not received any formal complaint from the workers but promised to investigate the workers' claims. Government allocated Shs398 billion for the tarmacking of Moroto-Soroti road, a three year project that started last year. China Railway N03 is handling the Moroto-Olilim- Katakwi section while China Communications Construction Company Limited will tarmac the Olilim-Soroti section.